On Christmas eve, each family member is allowed to pick one present under the tree to open early before Christmas morning. It was tough for Nickie to pick which gift she wanted to open tonight! Ultimately, she made her choice, and she is excited to be playing with her new plush candy this evening! Looks like it is going to be a brown Christmas! Though we dream of a powdery white Christmas each year, it looks like we’ll have to settle for dashing through the leaves and making leaf piles instead of snowmen. 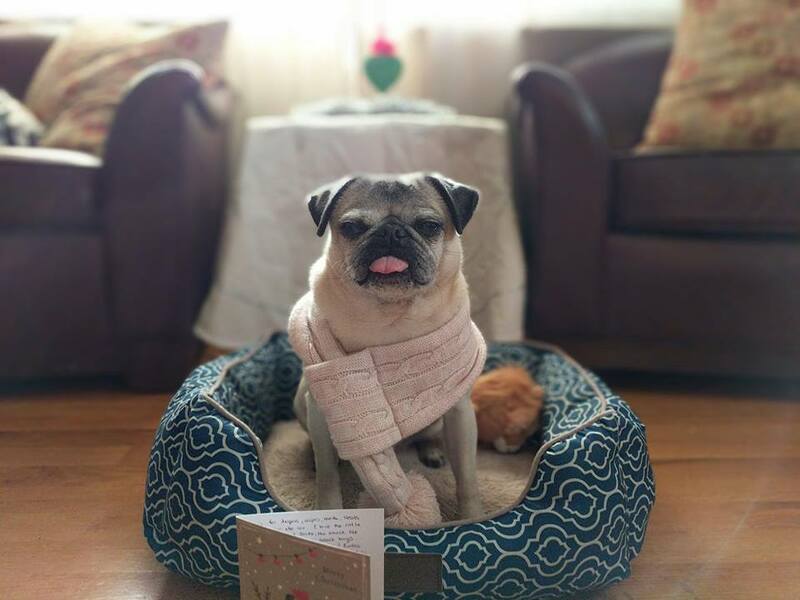 Despite the lack of winter wonderland outside, Nickie the pug is still full of holiday cheer! All dressed up and ready to look at Christmas lights! 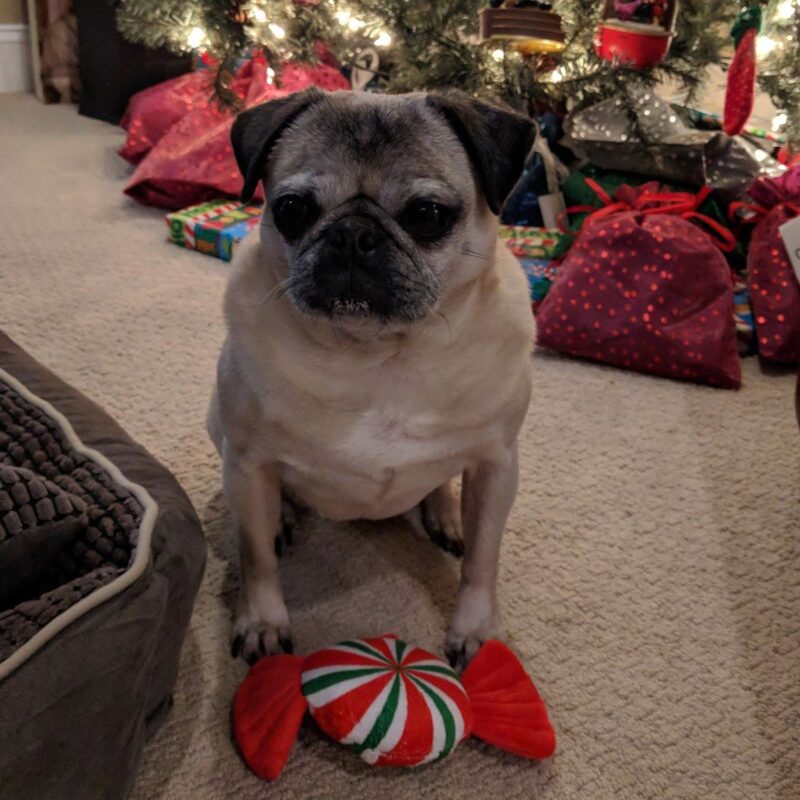 Nickie the pug loves the holidays, and one of her favorite holiday traditions is driving around the neighborhood checking out all of the beautiful twinkling Christmas lights with her family. 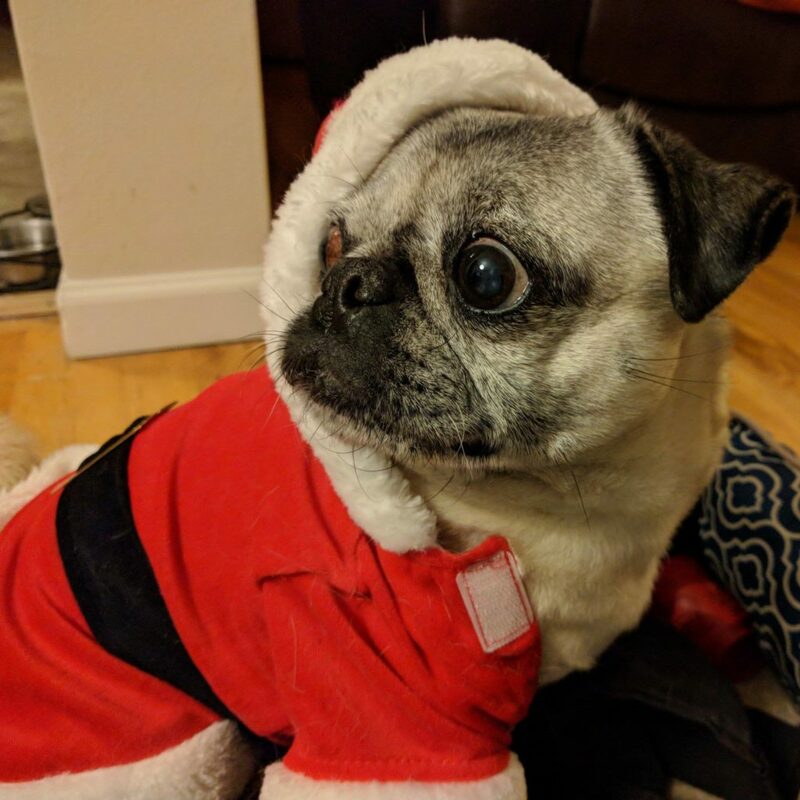 Nickie even put on her favorite Santa dress for the occasion! 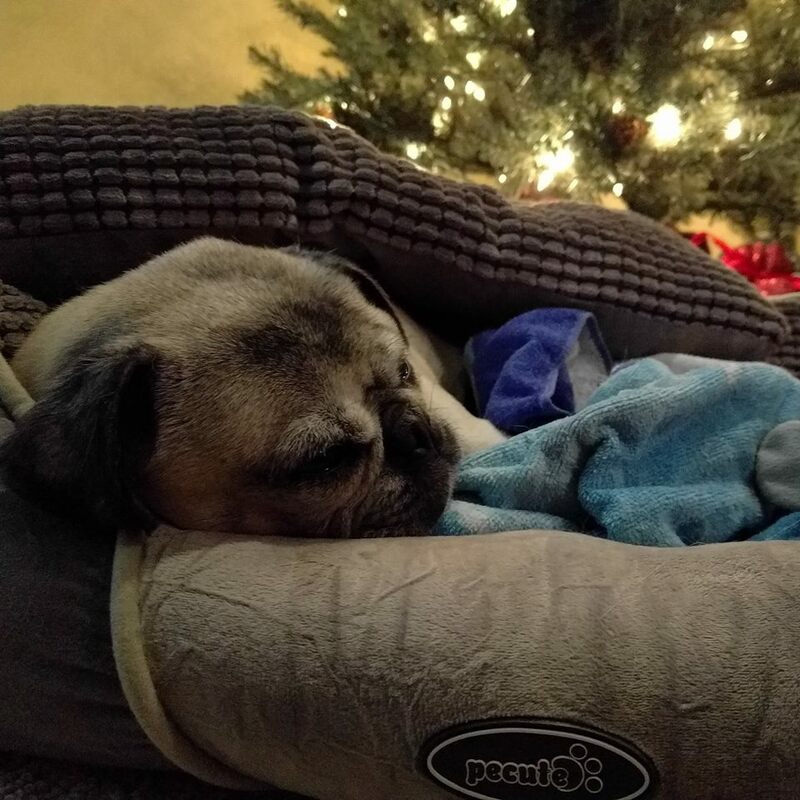 Nickie isn’t really a “morning pug”. It looks like she’s going to need a little extra motivation to get moving for some play time today! 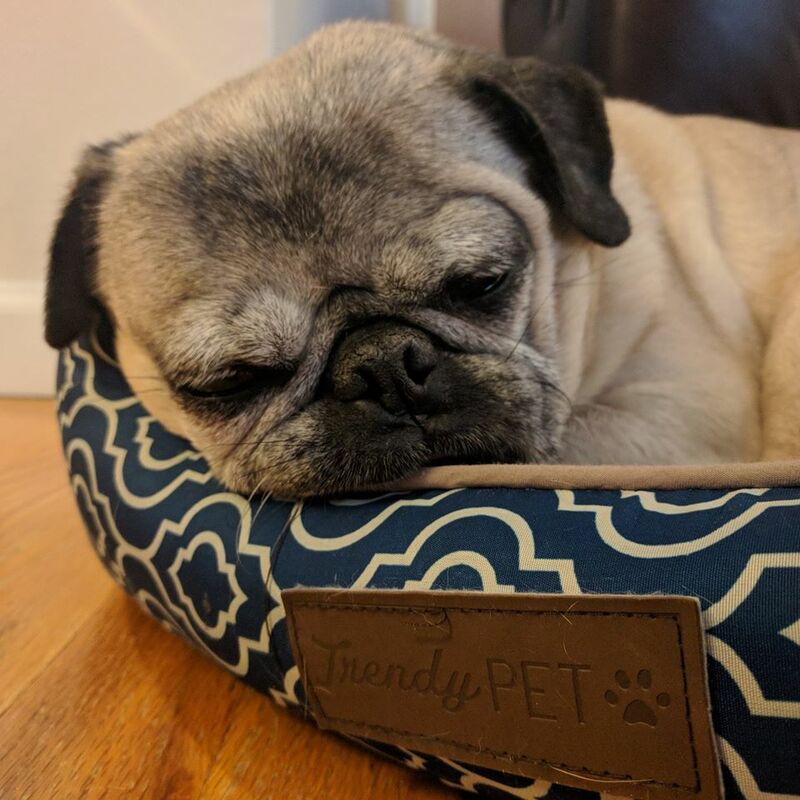 Holiday Pug Boxes are almost sold out! 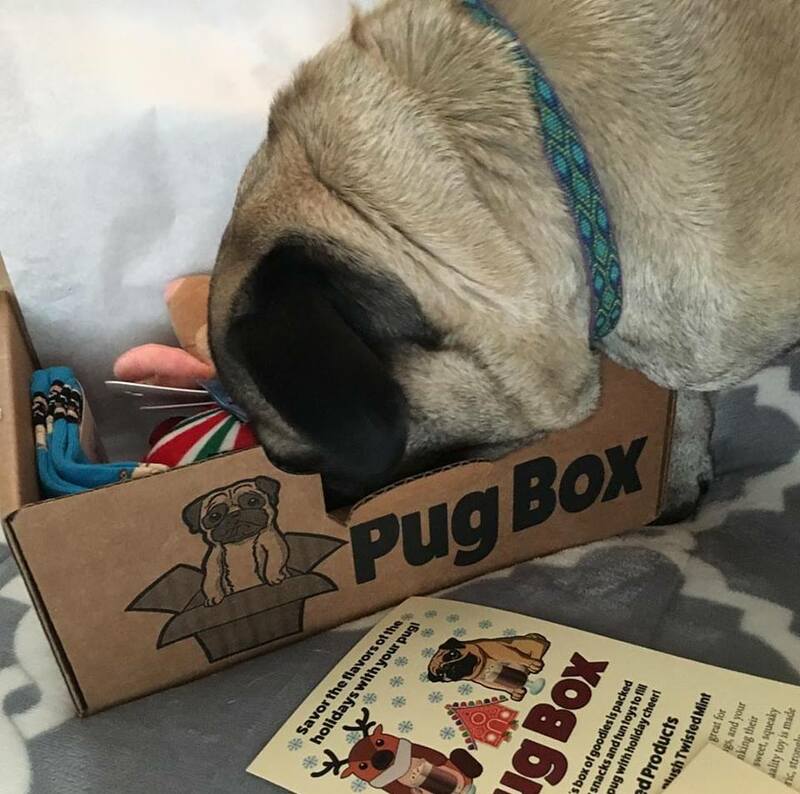 We love this photo of Carley the pug checking out all the great stuff in her holiday Pug Box! We’re almost completely sold out of holiday themed boxes, so get your order in soon if you don’t want to miss out on the holiday fun! 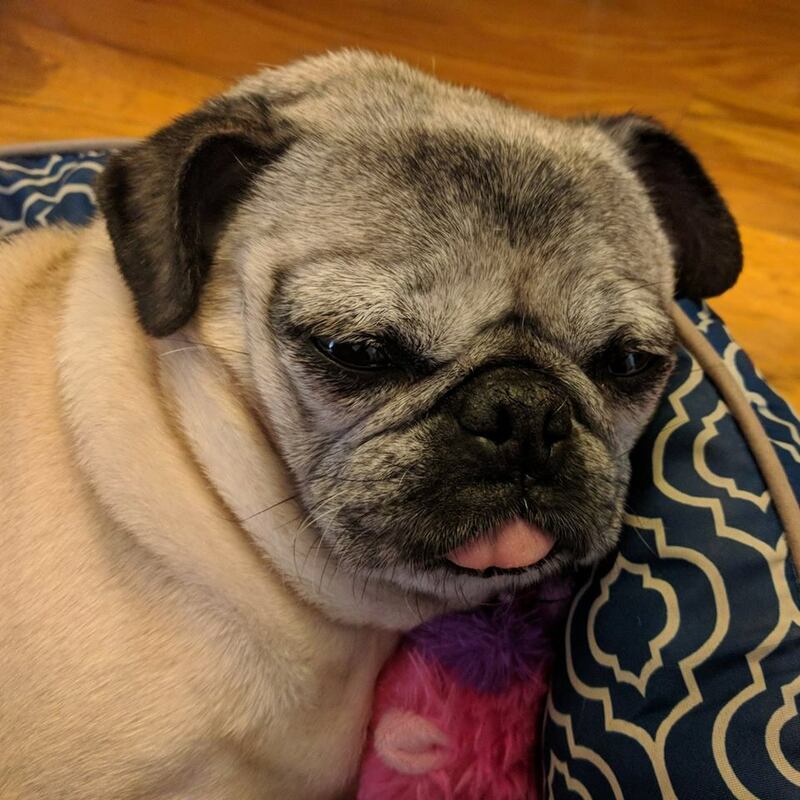 Nickie the pug hangs out with her tongue out most days, but that means she’s always ready to celebrate #TongueOutTuesday with her fur-ends! 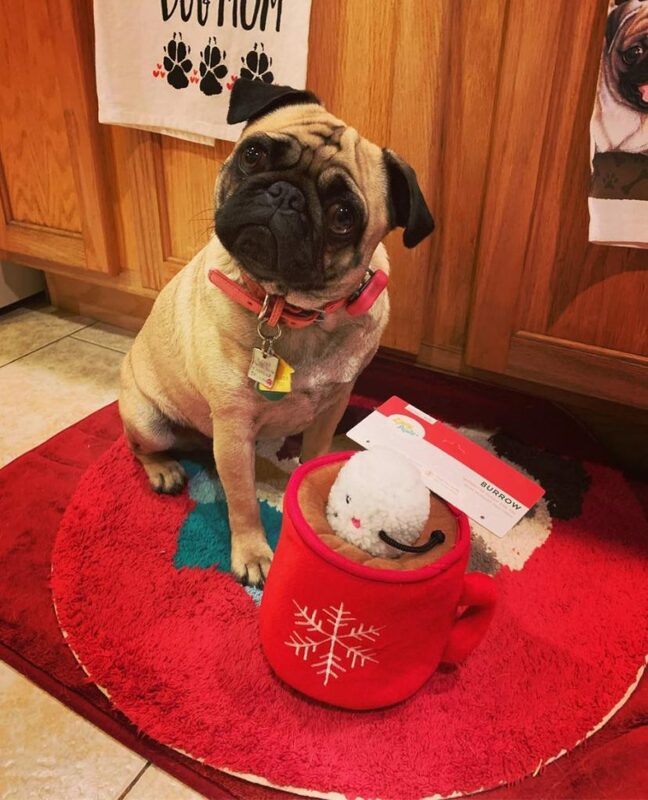 Hannah Banana Pants the Pug is looking cute with her new holiday toy from Pug Box! 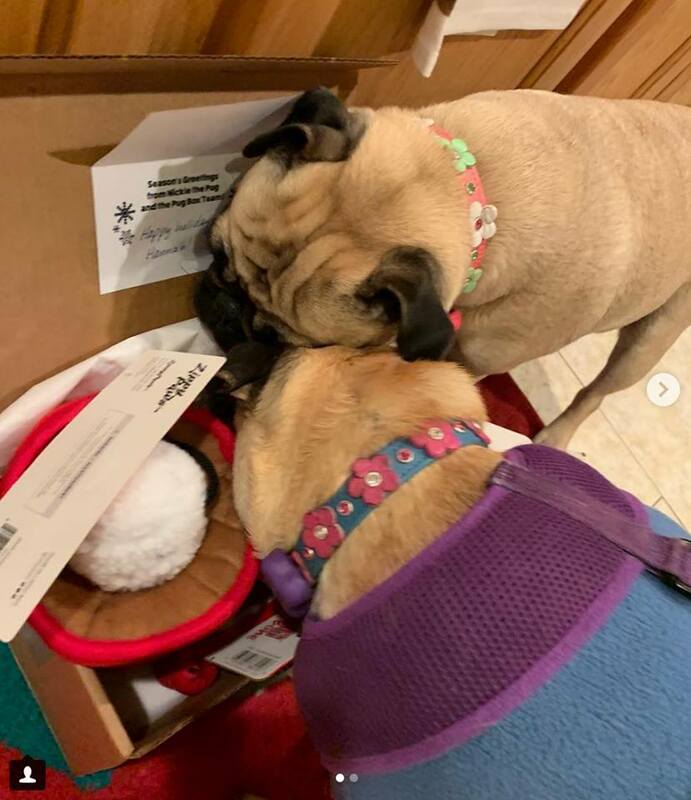 Here is an action shot of Miss Apricot Potato Pants and her sister Hannah Banana Pants the Pug diving into their holiday Pug Box!!! Adorable!!! 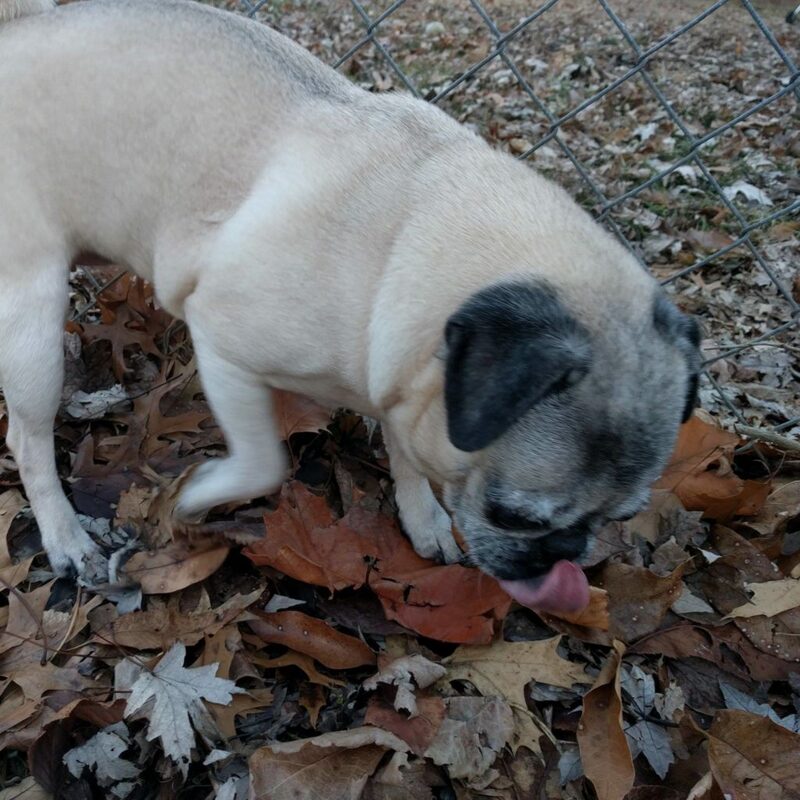 Nickie the pug can’t believe the weekend is over already! 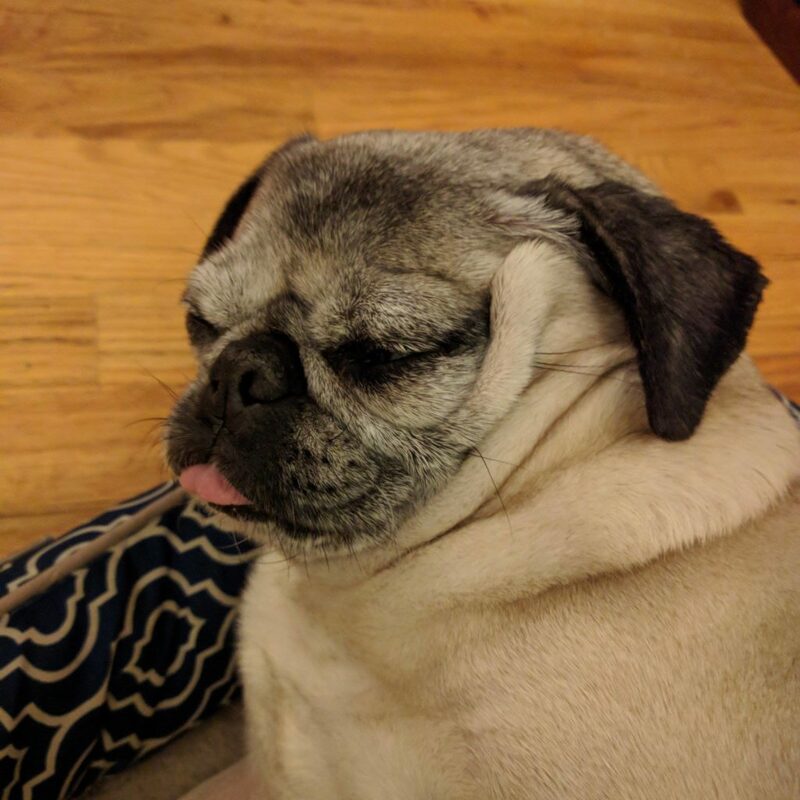 That’s okay though because she is ready to snooze right on through this Monday! Time to trim the tree!